We’ve spent the last few weeks talking about different ways astronomers are searching for exoplanets. But now we reach the most exciting part of this story: actually imaging these planets directly. Today we’re going to talk about the work NASA’s Spitzer Space Telescope has done viewing the atmospheres of distant planets. 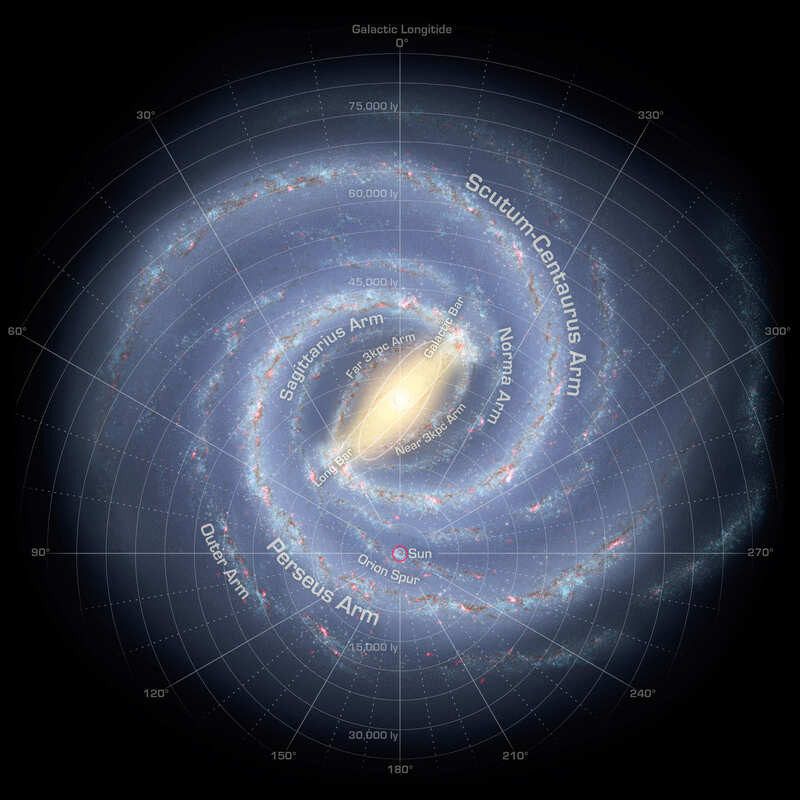 Touring the Milky Way’s a blast with this brand new 360-degree interactive panorama. More than 2 million infrared photos taken by NASA’s Spitzer Space Telescope were jigsawed into a 20-gigapixel click-and-zoom mosaic that takes the viewer from tangled nebulae to stellar jets to blast bubbles around supergiant stars. The new composite, using infrared images taken over the past decade, was compiled by a team led by UW-Madison astronomer Barbara Whitney and unveiled at a TEDactive conference in Vancouver, Canada Thursday. Unlike visual light, infrared penetrates the ubiquitous dust concentrated in the galactic plane to reveal structures otherwise obscured. Using your imagination to hover high above the galactic plane, you’d see the Milky Way is a flat spiral galaxy sporting a stubby bar of stars crossing its central bulge. The solar system occupies a tiny niche in a minor spiral arm called the Orion Spur two-thirds of the way from the center to the edge. At 100,000 light years across, the Milky Way is vast beyond comprehension and yet it’s only one of an estimated 100 billion galaxies in the observable universe. While you and I sit back and marvel at all the stellar and nebular eye candy, the Spitzer images are helping astronomers determine where the edge of the galaxy lies and location of the spiral arms. GLIMPSE images have already revealed the Milky Way to be larger than previously thought and shot through with bubbles of expanding gas and dust blown by giant stars. Spitzer can see faint stars in the “backcountry” of our galaxy — the outer, darker regions that went largely unexplored before. The new 360-degree view will also help NASA’s upcoming James Webb Space Telescope target the most interesting sites of star-formation, where it will make even more detailed infrared observations. When you play around with the interactive mosaic, you’ll notice a few artifacts here and there among the images. Minor stuff. What took some getting used to was how strikingly different familiar nebulae appeared when viewed in infrared instead of visual light. The panorama is also available on the Aladin viewing platform which offers shortcuts to regions of interest. Neil deGrasse Tyson, astrophysicist and host of the new Cosmos TV series, gave the third line of our “cosmic address” as the Milky Way after ‘Earth’ and ‘Solar System’. After a few minutes with GLIMPSE360 you’ll better appreciate the depth and breadth of our galactic home. That might seem like a sensational headline worthy of a supermarket tabloid but, taken in context, it’s exactly what’s happening here! The bright blue star at the center of this image is a B-type supergiant named Kappa Cassiopeiae, 4,000 light-years away. As stars in our galaxy go it’s pretty big — over 57 million kilometers wide, about 41 times the radius of the Sun. But its size isn’t what makes K Cas stand out — it’s the infrared-bright bow shock it’s creating as it speeds past its stellar neighbors at a breakneck 1,100 kilometers per second. K Cas is what’s called a runway star. It’s traveling very fast in relation to the stars around it, possibly due to the supernova explosion of a previous nearby stellar neighbor or companion, or perhaps kicked into high gear during a close encounter with a massive object like a black hole. As it speeds through the galaxy it creates a curved bow shock in front of it, like water rising up in front of the bow of a ship. This is the ionized glow of interstellar material compressed and heated by K Cas’ stellar wind. Although it looks like it surrounds the star pretty closely in the image above, the glowing shockwave is actually about 4 light-years out from K Cas… slightly less than the distance from the Sun to Proxima Centauri. The bright wisps seen crossing K Cas’ bow shock may be magnetic filaments that run throughout the galaxy, made visible through interaction with the ionized gas. In fact bow shocks are of particular interest to astronomers precisely because they help reveal otherwise invisible features and allow deeper investigation into the chemical composition of stars and the regions of the galaxy they are traveling through. Like a speeding car on a dark country road, runaway stars’ bow shocks are — to scientists — like high-beam headlamps lighting up the space ahead. Runaway stars are not to be confused with rogue stars, which, although also feel the need for speed, have been flung completely out of their home galaxies. After 10 years in space — looking at so many galaxies and stars and other astronomy features — the Spitzer Space Telescope is being deployed for new work: searching for alien worlds. The telescope is designed to peer in infrared light (see these examples! ), the wavelength in which heat is visible. When looking at infrared light from exoplanets, Spitzer can figure out more about their atmospheric conditions. Over time, it can even detect brightness differences as the planet orbits its sun, or measure the temperature by looking at how much the brightness declines when the planet goes behind its star. Neat stuff overall. Of course, the telescope wasn’t designed to do this. But to paraphrase the movie Apollo 13, NASA was interested in what the telescope could do while it’s in space — especially because the planet-seeking Kepler space telescope has been sidelined by a reaction wheel problem. Redesigning Spitzer, in a sense, took three steps. Fixing the wobble: Spitzer is steady, but not so steady that it could easily pick out the small bit of light that an exoplanet emits. Engineers determined that the telescope actually wobbled regularly and would wobble for an hour. Looking into the problem further, they discovered it’s because a heater turns on to keep the telescope battery’s temperature regulated. “The heater caused a strut between the star trackers and telescope to flex a bit, making the position of the telescope wobble compared to the stars being tracked,” NASA stated. In October 2010, NASA decided to cut the heating back to 30 minutes because the battery only needs about 50 per cent of the heat previously thought. Half the wobble and more exoplanets was more the recipe they were looking for. Repurposing a camera: Spitzer has a pointing control reference sensor “peak-up” camera on board, which originally gathered up infrared light to funnel to a spectrometer. It also calibrated the telescope’s star-tracker pointing devices. The same principle was applied to infrared camera observations, putting stars in the center of camera pixels and allowing a better view. Remapping a camera pixel: The scientists charted the variations in a single pixel of the camera that showed them which were the most stable areas for observations. For context, about 90% of Spitzer’s exoplanet observations are about a 1/4 of a pixel wide. That’s pretty neat stuff considering that Spitzer’s original mission was just 2.5 years, when it had coolant on board to allow three temperature-sensitive science instruments to function. Since then, engineers have set up a passive cooling system that lets one set of infrared cameras keep working. It’s a case of mistaken identity: a near-Earth asteroid with a peculiar orbit turns out not to be an asteroid at all, but a comet… and not some Sun-dried burnt-out briquette either but an actual active comet containing rock and dust as well as CO2 and water ice. The discovery not only realizes the true nature of one particular NEO but could also shed new light on the origins of water here on Earth. Designated 3552 Don Quixote, the 19-km-wide object is the third largest near-Earth object — mostly rocky asteroids that orbit the Sun in the vicinity of Earth. According to the IAU, an asteroid is coined a near-Earth object (NEO) when its trajectory brings it within 1.3 AU from the Sun and within 0.3 AU of Earth’s orbit. About 5 percent of near-Earth asteroids are thought to actually be dead comets. Today an international team including Joshua Emery, assistant professor of earth and planetary sciences at the University of Tennessee, have announced that Don Quixote is neither. Read more: 3552 Don Quixote… Leaving Our Solar System? Using the NASA/JPL Spitzer Space Telescope, the team — led by Michael Mommert of Northern Arizona University — reexamined images of Don Quixote from 2009 when it was at perihelion and found it had a coma and a faint tail. Emery also reexamined images from 2004, when Quixote was at its farthest distance from the Sun, and determined that the surface is composed of silicate dust, which is similar to comet dust. He also determined that Don Quixote did not have a coma or tail at this distance, which is common for comets because they need the sun’s radiation to form the coma and the sun’s charged particles to form the tail. The researchers also confirmed Don Quixote’s size and the low, comet-like reflectivity of its surface. This discovery implies that carbon dioxide and water ice might be present within other near-Earth asteroids and may also have implications for the origins of water on Earth, as comets are thought to be the source of at least some of it. The amount of water on Don Quixote is estimated to be about 100 billion tons — roughly the same amount in Lake Tahoe. The findings were presented Sept. 10 at the European Planetary Science Congress 2013 in London. 3552 Quixote isn’t the only asteroid found to exhibit comet-like behavior either — check out Elizabeth Howell’s recent article, “Asteroid vs. Comet: What the Heck is 3200 Phaethon?” for a look at another NEA with cometary aspirations. Even though it comprises over 99% of the mass of the Solar System (with Jupiter taking up most of the rest) our Sun is, in terms of the entire Milky Way, a fairly average star. There are lots of less massive stars than the Sun out there in the galaxy, as well as some real stellar monsters… and based on new observations from the Atacama Large Millimeter/submillimeter Array, there’s about to be one more. Early science observations with ALMA have provided astronomers with the best view yet of a monster star in the process of forming within a dark cloud of dust and gas. Located 11,000 light-years away, Spitzer Dark Cloud 335.579-0.292 is a stellar womb containing over 500 times the mass of the Sun — and it’s still growing. Inside this cloud is an embryonic star hungrily feeding on inwardly-flowing material, and when it’s born it’s expected to be at least 100 times the mass of our Sun… a true stellar monster. The star-forming region is the largest ever found in our galaxy. Watch: What’s the Biggest Star in the Universe? SDC 335.579-0.292 had already been identified with NASA’s Spitzer and ESA’s Herschel space telescopes, but it took the unique sensitivity of ALMA to observe in detail both the amount of dust present and the motion of the gas within the dark cloud, revealing the massive embryonic star inside. The image above, a combination of data acquired by both Spitzer and ALMA (see below for separate images) shows tendrils of infalling material flowing toward a bright center where the huge protostar is located. These observations show how such massive stars form — through a steady collapse of the entire cloud, rather than through fragmented clustering. SDC 335.579-0.292 seen in different wavelengths of light. Read more on the ESO news release here. This is just pretty! 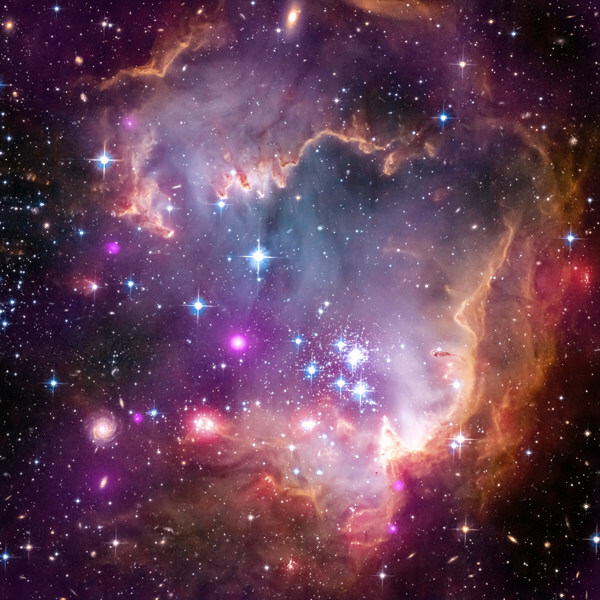 NASA’s Great Observatories — the Hubble Space Telescope, the Chandra X-Ray Observatory and the Spitzer Infrared Telescope — have combined forces to create this new image of the Small Magellanic Cloud. The SMC is one of the Milky Way’s closest galactic neighbors. Even though it is a small, or so-called dwarf galaxy, the SMC is so bright that it is visible to the unaided eye from the Southern Hemisphere and near the equator. The Small Magellenic Cloud in X-Ray from the Chandra X-Ray Observatory. Credit: NASA. The Small Magellenic Cloud in infrared, from the Spitzer Infrared Telescope. Credit: NASA. The Small Magellenic Cloud as seen in optical wavelengths from the Hubble Space Telescope. Credit: NASA. The various colors represent wavelengths of light across a broad spectrum. X-rays from NASA’s Chandra X-ray Observatory are shown in purple; visible-light from NASA’s Hubble Space Telescope is colored red, green and blue; and infrared observations from NASA’s Spitzer Space Telescope are also represented in red. The three telescopes highlight different aspects of this lively stellar community. Winds and radiation from massive stars located in the central, disco-ball-like cluster of stars, called NGC 602a, have swept away surrounding material, clearing an opening in the star-forming cloud. Find out more at this page from Chandra, and this one from JPL.